ANIVRAM REPRESENTING SNEAKER CULTURE: Quickstrike Alert : Big Nike "Lil Dez"
The Big Nike is relatively new in Nike's lineup, but it has made significant ground since its creation because of its excellent design and releases such as the Flintstones Pack. So its no surprise that another killer release is on its way, this time commemorating Lil Dez, Kobe Bryant and Lebron James' puppet friend on Nike commercials. 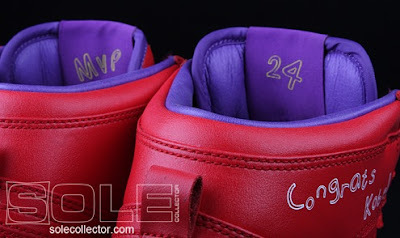 This sneak also commemorates Kobe Bryant and the LA Lakers for their victory in the NBA Finals. 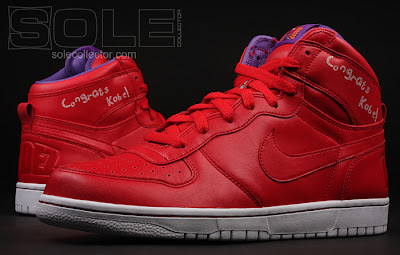 On the outer ankle area you can find "Congrats Kobe" written. There even is a picture of Lil Dez right on the tongue, along with his name on the back of the sneaker. Now the real question here is :is this a Quickstrike worth getting? Well there is a couple things to consider. First off, the fact alone that it is a Quickstrike already makes it worth getting ^.^. Second - the sneaker just looks gorgeous. 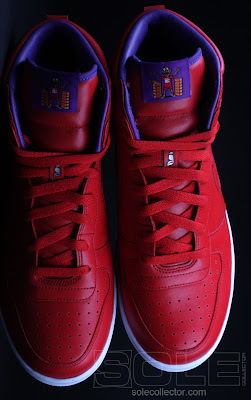 Its a nice sport red upper with a white mid sole and just enough purple to accentuate the tongue. 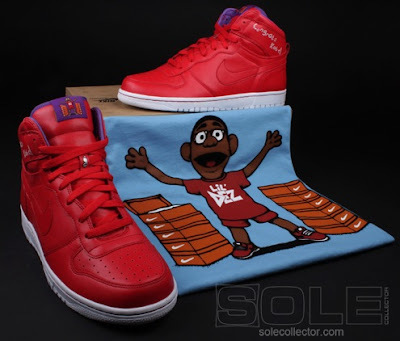 Third - It even comes with a featured t-shirt with Lil Dez on it to match the sneaker. My honest advice? Keep your eyes peeled for the release, its going to be SOON! This is a Quickstrike you don't want to miss. Labels: Big Nike "Lil Dez"